An economic boom is the expansion and peak phases of the business cycle. It's also known as an upswing, upturn, and a growth period. During a boom, key economic indicators will rise. Gross domestic product, which measures a nation's economic output, increases. So does productivity since the same number of workers creates more goods and services. Business sales increase, driving up profits.As a result, business and family incomes. A boom is accompanied by a bull market in stocks and a bear market in bonds. Booms also run the risk of high inflation. That happens when demand outstrips supply, allowing companies to raise prices. The National Bureau of Economic Research determines when a boom occurs. It uses economic indicators such as employment, industrial production, and retail sales. Since 1854, there have been 33 boom and bust cycles. On average, each boom cycle lasts 38.7 months. A boom starts when economic output, as measured by GDP, turns positive. Most leading economic indicators have already turned positive before that. The cause of a boom is an increase in consumer spending. As the economy improves, families become more confident. They are buoyed by better jobs, rising home prices, and a good return on their investments. As a result, they no longer need to delay major purchases. The world's central banks use monetary policy to keep booms going as long as possible. To achieve that, they aim for an ideal growth rate between 2 and 3 percent. If the rate goes over this ideal range, the economy risks going into the peak phase of the business cycle. That causes inflation, bad investments, and too much debt. To keep inflation at bay, the U.S. Federal Reserve sets a target inflation rate of 2 percent. The Fed uses the core inflation rate because it removes volatile food and oil prices. A boom ends when GDP turns negative. That's the contraction phase of the business cycle. It signals the start of a recession. 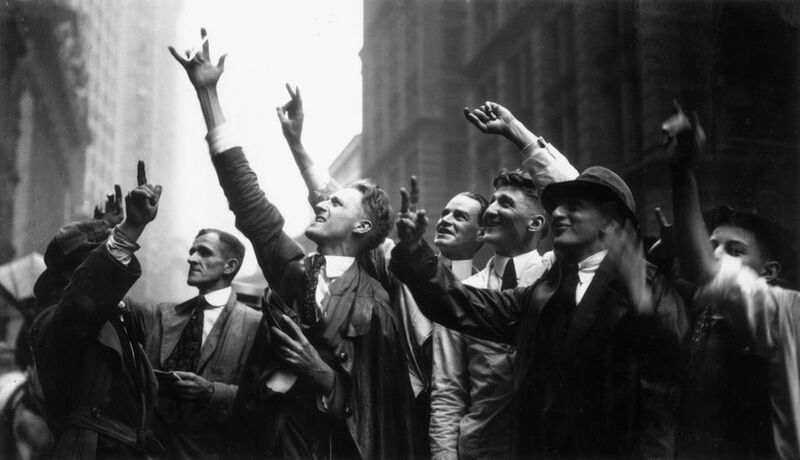 During the Roaring Twenties, the U.S. economy grew 42 percent. It produced almost half of the world's total output. Average income rose from $6,460 to $8,016 per person. The stock market increased in value by 20 percent a year. Unemployment stayed at around 4 percent. The boom was caused by the end of World War I. Returning veterans brought back new perspectives and skills. While the men were gone, women had become independent. New inventions, like the auto assembly line, made consumer goods available at reasonable prices. An expanded banking industry made credit available. That spurred purchases of cars, washing machines, and stocks. By the end of the decade, it had shifted the United States from a traditional, farm-based economy. It became a free market, consumer products based economy. The boom after World War II lasted 37 months, from October 1945 to November 1948. During that time, Americans purchased 20 million refrigerators, 21.4 million cars, and 5.5 million stoves. The 1944 GI Bill of Rights helped cause the boom. It gave loans to returning veterans for education and training. It provided federal loan guaranties so they could buy homes, farms, and businesses. It created a fund to pay veterans if they were unemployed. The Employment Act of 1946 also assisted. For the first time, the federal government took permanent responsibility for providing jobs. As a result, 80 percent of the more than 20 million civilians and soldiers who returned from the war found jobs by mid-1947. In 1944, the Bretton Woods conference cemented America's position as a world leader. It established the U.S. dollar as the dominant global currency, replacing the gold standard. It also established the International Monetary Fund and the World Bank to spur global growth. The boom ended with the onset of the Cold War in 1947. That year, the House Un-American Committee raised the specter of Communist subversion at home with its well-publicized hearings. The recession was mild and short-lived. During the 1950s, the economy grew 50 percent. GDP went from $2 trillion to $3 trillion, adjusted for inflation. Income per person rose 25 percent, from $13,819 to $17,380. These figures are not adjusted for inflation. The Korean War lasted from 1950 to 1953. The nation spent $30 billion, which created the first economic boom. The contraction occurred after the war ended. President Eisenhower signed the Federal Highway Act on October 22, 1956. It authorized the construction of the nation's interstate highway system. More than $1 billion was allocated to the first year of "the greatest public works program in the history of the world." Television advertising rose from $41 million to $335 million between 1951 and 1953. By the end of the decade, 90 percent of American homes had a television. Like the Roaring Twenties, this boom grew on the backs of new consumer products. The 1990s expansion lasted from March 1991 to March 2001. GDP was positive for an unprecedented 120 months. One reason for the expansion's success was its healthy rate of growth compared to previous booms. A review of GDP by year shows that the economy never grew faster than 4.5 percent. That occurred in 1999 when it grew 4.8 percent. Another reason was that inflation was mild. Examining inflation by year reveals that price increases remained below 3 percent save for 1991 and 1996. Falling foreign prices kept U.S. imports affordable. The 1990s benefited from the launch of the internet. In 1991, Congress passed the High-Performance Computing Act. It opened the internet for commercial use by establishing the National Research and Education Network. The federal government pumped $1.5 billion into internet research. As a result, companies set up websites and began to sell goods directly to customers. That same year, researchers at the University of Illinois developed a user-friendly browser called Mosaic. It allowed users to see words and pictures on the same page for the first time. In 1995, the initial public offering of Netscape kicked off the dot-com bubble. Netscape was the descendant of Mosaic, and it had 90 percent market share. In 1995, there were 16 million online users. They had to use dial-up connections. By 1999, there were 248 million users. Other new technologies allowed consumer products to remain affordable. As a result, companies enjoyed healthy profit margins. Moderate growth and mild inflation allowed the Fed to keep interest rates low. The benchmark fed funds rate never exceeded 5.5 percent. As a result, loans were affordable.